Registration for Spring 2019, FC Thunder Skills (Rec) Program is now OPEN! FC Thunder is proud to again offer additional training focused on individual player development for players in the Recreational program. Specially designed skill training for players ages U4 - U11+ of all abilities, for one hour, once per week, for 10 weeks with FC Thunder Coaches. All training sessions will include fun games and scrimmages. The FC Thunder Skills program can be considered "Recreational Soccer Plus." Players in the FC Thunder Skills program will practice and play games in the Recreational program. 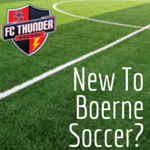 In addition, players will have a second training session each week with professional FC Thunder trainers and will have an additional "friendly" game day within the FC Thunder Skills program during the Recreational season. Option 1: Love to play on a team, play on Saturday and want to take your game to a higher level, then FC Thunder Skills is a great addition to our Rec Program! Option 2: Not playing on a team this season or can't play games on Saturday's, but you want to better your game, then you sign up for FC Thunder Skills as a standalone soccer program! COPA DE THUNDER GAME WEEK WILL BE DURING THE FINAL WEEK OF SKILLS at Boerne City Park! In order to properly show off all the new skills your player will have learned in FC Thunder Skills, we are holding a Thunder Day. We have set the last skills session aside to hold "Friendlies" for our FC Thunder players to show off what they have learned throughout the season. Parents, family, and friends are welcome to come and watch and cheer on their player. Thunder Skills players wear the Yellow Training Jersey (black shorts, black socks). Please ignore the "START HERE" and scroll down to the required Yellow jersey.